Mynard, J. (2010). Editorial. Studies in Self-Access Learning Journal, 1(1), 1-4. Welcome to the very first edition of the journal Studies in Self-Access Learning, which will otherwise be known as SiSAL ( /si:sæl/). SiSAL began life as a modest project at an institution of higher education in Japan. Originally intended as an internal publication which would serve the team of administrative staff, teachers and learning advisors at Kanda University of International Studies and its associated institutions, the journal developed out of a desire to archive and share ongoing work with each other and also with interested colleagues. However, colleagues at Kanda and elsewhere expressed surprise that the initiative should have such a limited scope; surely this was a golden opportunity for professionals in the field around the world to learn from each other? After considerable reflection, it was agreed that SiSAL Journal should be launched as a peer review journal, providing articles, reports, reviews, perspectives and work in progress to educators and staff involved in self-access learning worldwide. I am certain that SiSAL Journal has a significant role to play in the field of applied linguistics for a number of reasons. Firstly, it is a fact that relatively little has been published about self-access in recent years and it is both important and necessary to ensure that the practice of self-access learning remains within the consciousness of teachers and other practitioners. Secondly, SiSAL will highlight the fact that in many institutions, self-access facilities continue to be an integral part of the learning experience for the study of languages. While in such institutions the importance of self-access facilities tends to be taken for granted, it must be remembered that in other institutions, colleagues are not so well-versed in what self-access learning is, beyond setting homework, nor are they altogether clear about what it is that distinguishes a Self-Access Centre from a computer lab or a library. Unless more ongoing research and descriptions of practice related to self-access are published, there is a real danger that these misunderstandings and misconceptions will continue. What this journal has the potential to do is to show that SACs are very much thriving and moving in exciting new directions as practice continues to be informed by research as well as being enhanced by technological developments. Another important role that SiSAL Journal can play is in promoting research and critical reflection in order to influence future directions in the field. SACs should always be a ‘work in progress’. There are always new materials to consider and new ways of using, presenting, adapting and organising existing materials. Learners’ needs and preferences change over time due to a number of factors and meeting these fluctuating predilections requires constant vigilance and alertness. It is also important to continue to pay attention not just to material resources, but to human resources too. In what ways can learners be supported by staff, peers, teachers and learning advisors? Innovations implemented at a SAC in one part of the world, however remote, may be incorporated into another SAC elsewhere and SiSAL Journal has a role to play both in the cross-pollination of ideas and in the dissemination of this research and practice. 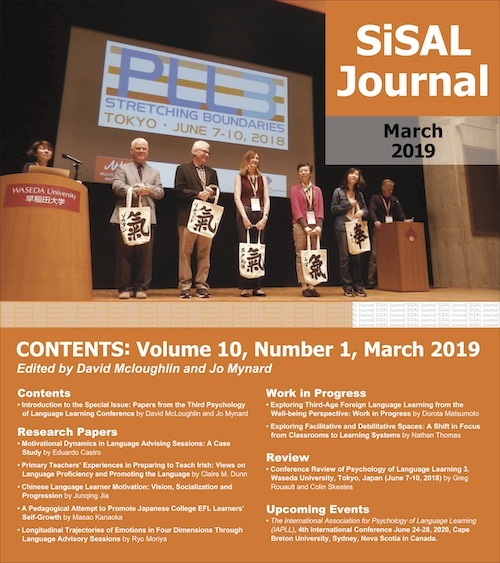 Readers will note that this first edition of SiSAL is mainly focussed on the Japanese context; this is due to the original scope of the journal and the fact that work had already begun on the submissions. Rather than delay the launch, we decided to go ahead as scheduled, feeling as we did that although the context being shared is that of Japan, the articles should still be of interest to those working in the field of self-access learning in general. We anticipate that future issues will have a more international flavour and with this view in mind, we invite you to submit articles, reports, reviews, perspectives and work in progress. The forthcoming issues of SiSAL will focus on particular themes which highlight various elements of self-access learning. It seemed appropriate that the first issue should have the theme of ‘principles and practices’ in order to define the field, while the next issue has the theme of ‘materials and activities’. Since the theme of this issue, as just mentioned, is ‘principles and practices’, we begin with Lucy Cooker’s article ‘Some self-access principles’. Based on her experience in the field, Lucy outlines four principles which she finds are crucial for the success of a SAC. Following this, Keith Barrs, in his opinion piece, takes a look at two SACs that he has experience with. He discusses those elements that he noted as being present in a successful SAC and suggests what could be lacking in a less successful centre. The scope of this journal includes skills support centres such as writing centres and conversation lounges, so we are delighted to feature two full articles which showcase research in these areas. Jim McKinley asks the question ‘What do students really need?’, in his article on writing centres. He challenges the assumption that a writing centre overseas should be modelled on centres in the United States and describes some research where he investigates students’ expectations and needs. Heath Rose and Roxanne Elliot conducted a research study into how university students used an English-only conversation lounge and these results are shared in this article. Another challenge faced by educators and programme coordinators is how to appropriately address the integration of self-access within a curriculum. Gene Thompson and Lee Atkinson describe some of the challenges that they faced when doing just that at their institution and outline some of the principles which they established in order to overcome them and meet the needs of the students. Thus far, the articles describe programmes that are already underway, so it is useful to be able to feature a ‘work in progress’ piece by Jon Rowberry. Jon describes some of the ways in which his institution is addressing the many aspects involved in the establishment of a new self-access centre. The final piece is a report on the themes arising at the forum dedicated to self-access at the recent Japan Association of Language Teachers (JALT) conference. I hope you enjoy this first issue and find applications which will be useful in your own work, no matter where you are in the world. Jo Mynard is the Director of the Self-Access Learning Centre and Assistant Director of the English Language Institute at Kanda University of International Studies in Japan. She holds an Ed.D. in TEFL from the University of Exeter, UK and an M.Phil. in applied linguistics from Trinity College Dublin. She has taught EFL in Ireland, Spain, England, the UAE and Japan, and has been involved in facilitating self-access learning since 1996. I would like to express my appreciation to Lucy Cooker and Carol Everhard for their comments and suggestions on this first editorial. I would also like to thank the authors and members of the review and editorial teams for helping to create this issue and set the pace for future issues. Finally, the journal would probably not have reached this stage had it not been for the encouragement given by Christopher Candlin and Tim Murphey. Thank you both!